2017 marks the 10 year anniversary of Kt Simpson founding Copperdollar Immersive Performance Company. What a better way to start our new blog than with a post about how it all began? After an extensive period of working as a performer across the globe, Kt decided it was time to create her own show. She started with a scrap book and an interest in blurring the boundaries between art forms and audience-performer relationships. Drawing inspiration from a range of different cultures, histories and folk stories, her ideas began to come to life. 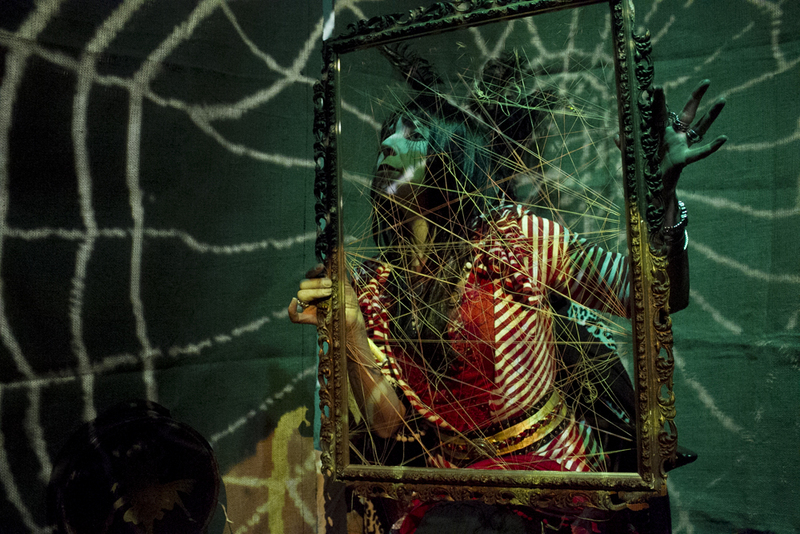 Being born on the 31st of October made Halloween a logical place for Kt to start with her exploration for themes for the show. In 2007, with the help of creative producer, Jo Smith, Kt received funding from the Art Council to research and develop her show. It was during this research period that she discovered more about the roots of Halloween, from the Celtic Festival of Samhien to the infamous Mexican ‘Day of the Dead’. Kt met Digital Visual Artist, Ben Sheehan, who shared her interested in shows with audience interaction. He specialised in creating illusions with a range of new technologies and Kt worked with him to incorporate this into her shows. Kt also collaborated with talented local artist, Jim Sanders, after seeing an exhibition of his and noticing his work and her show concepts had undeniable similarities. The sugar skull-esque face of Copperdollar was born out of their partnership and neither it nor the companies red, white and black colour scheme has changed over the last 10 years. The performance company consisted of friends, former colleagues and other people from the world of performance that she had worked in for nearly 25 years. They took their first show, a walkabout called “’The Stylus and The Stimulators”, to Trash City and Shangri La at Glastonbury Festival that same year. 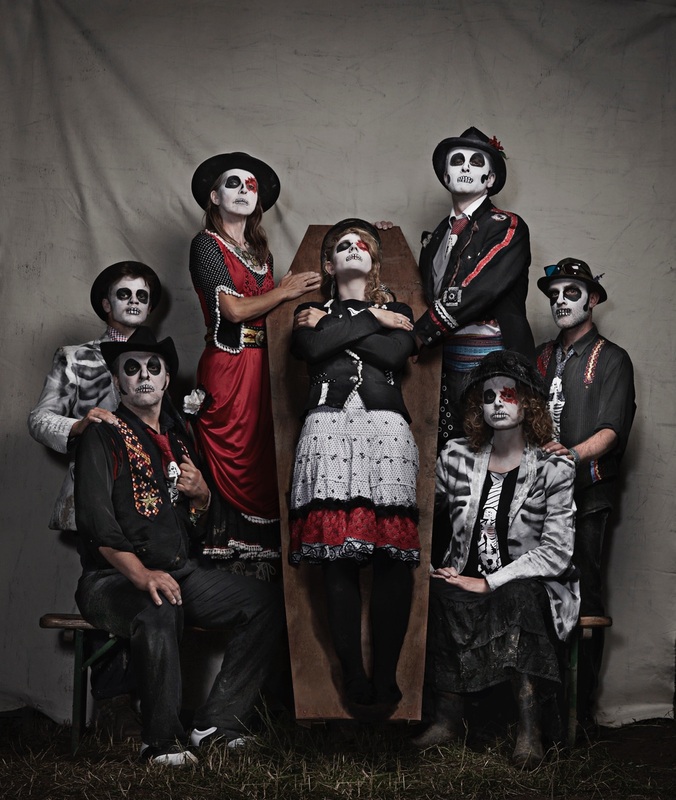 In 2009, Copperdollar won an award for their first big show, “Wake the Dead”, at the Brighton Fringe before returning to Glastonbury in the shape of a large parade named “The Ghost Walk”. It arrived (by chance) in the crowd of the West Holt Stage as “Thriller” was played in tribute to Michael Jackson, who had died that day. The company was noticed by Bridey Watson, the artistic director of a new, Mexican themed field called ‘the Common’. Bridey invited Kt to produce a show in a small tent for ‘the Common’, so, 2010 saw Copperdollar return for the 3rd time to Glastonbury but this time, with their own venue. Kt had found inspiration in folk tales. Looking at archetypical characters such as the ‘Trickster’ and a Spider Woman, who weaved together the worlds in which the living exist and the world of the dead, was just what Kt needed to write and develop her show, “Oya/Anansi”. 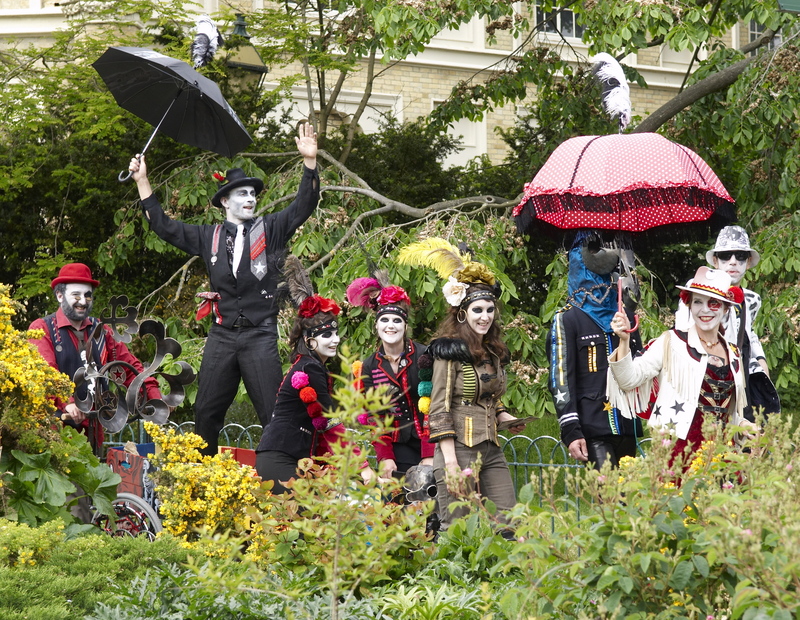 It went on to receive funding and became “Spidora”, a sideshow that toured Britain’s street theatre festivals for three years. After its success in 2010, Copperdollar was given a bigger site in which to perform at Glastonbury. Kt built on the award winning show she had produced in 2009 and “The Back of Beyond” came into being. It began in 2011 and was a true collision of art, performance, music and technology. The venue served as a place where the audience could reflect on both life and death. A world of dead carney folk welcomed them in to join a party. Marc Ellis, known as DJ Marc Stylus, played an eclectic mix of sounds which got the celebration going and kept it alive until dawn. There was no stage, which enabled a focus on the performers, who integrated with the viewers. The shows had a number of special and uniting features, from the wishing tree to scented night garden with a magical shed! Each show finished with ‘Maria De La Meurte’’ (the bride of the dead)’s ceremonial dance which had choreographic moves from traditions all over the world. The underlying message of the show was not one to be missed: it is important to not just grieve but to also celebrate those who have passed. “The Back of Beyond” became one of the BBC’s highlights of the festival. Copperdollar and Marc Ellis went on to compile an album, released by Freshly Squeezed music, which was a reflection of the show. Many audience members returned to see the show and hear the music time and time again. Whilst Copperdollar has continued to evolve and has entertained over 50,000 people so far, the concept of this show has remained the same. In 2015, Kt inherited a sideshow from her close friend and female magician, Rosa Parkin, who passed away. It is currently being redeveloped and is set to tour in 2018. In the meantime, Copperdollar is working on new ideas for the future. Kt had had visions of buying a space where her theatre company and other people in the industry could devise and rehearse. In 2013, a place she’d been looking at for many years became available. The building, a former stable which had once been used as a wood workshop, had been empty for a long time. With funding from the Arts council, Kt set to work with her husband and a builder turned friend to renovate and breath new life into the building. Working hard not to lose its wonderful atmosphere, Kt insisted on upcycling as much of the old materials. She spent 5 months working alongside the builders and managed to get it just right. Since 2015, Copperdollar Studios have been up and running. The two studios have been used by a huge range of talented people, from actors and dancers to photographers and film makers. Check out the studio’s Instagram for regular pictures and to see who’s been in the studio. You can also subscribe to our newsletter for updates.